Saraswati_Library is one of more than 5,000 organizations on LibraryThing. About meOur library is guided by and named in honour of the Divine Mother Saraswati. 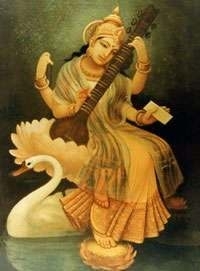 Saraswati Ma is the Goddess of learning, knowledge and wisdom of the highest spiritual kind. She is also the Goddess of fine arts and speech. As a compound word, ‘Saraswati’ consists of ‘sar’ and ‘swa’; 'sar' meaning the essence (Essential Nature) and 'swa' the Self (the Higher Self). Goddess Saraswati is generally represented as sitting on a white lotus, accompanied by her white swan (Her vehicle), holding a spiritual text or book, playing her veena (stringed musical instrument) and singing eternally the song of Divine Wisdom in the soul of each being. About my librarySaraswati Library Rocklyn is located at the Satyananda Yoga Ashram, 393 Dean-Barkstead Road, Rocklyn, Victoria, Australia. It is a specialised library of yoga and related subjects, primarily available to yoga teachers and students of Satyananda Yoga Academy Australia. Yoga teachers, yogic studies students, ashram residents and guests can use and borrow from the Saraswati Library during their ashram stay. Loans of books for use outside the Ashram are available to our enrolled yogic studies students (academic policy applies), to current members of the Yoga Association of Victoria (YAV) and to subscribed library members (annual fee applies). Any donated books which are not in keeping with the library's ‘Collection Development Policy’, or are excess to requirements, are sold or donated elsewhere as appropriate. Any funds raised are used to buy new titles for the library. Donations of money to fund the purchase of books is also welcome. NOTE: There is also a Saraswati Library located at the Satyananda Yoga Ashram, Mangrove Mountain, NSW, Australia. This library is currently in the process of being catalogued on LibraryThing. LocationSatyananda Yoga Ashram, Rocklyn, Victoria, Australia.